"Want your new best friend to come right to you?" That's the question the Best Friends Animal Society's 15-second pet-adoption-promotion video of adorable Maddie, a fluffy-haired border collie mix trotting towards you to slather you in a sloppy love smooch, begins with. The video concludes with the happy sentiment "See how good it feels to give a homeless dog a home." Pictured above is Mirk, an available border collie from Western Border Collie Rescue. 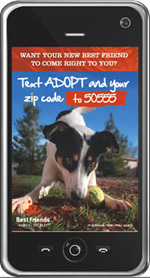 You can text your zip code to find that just-right pet to adopt in your area! Maddie is the star of the promotional video that is currently playing on the Geoffrey Tron in Times Square in New York City. She was once a down-on-her-luck shelter pooch who was rescued by Western Border Collie Rescue and has since been adopted into her forever home. 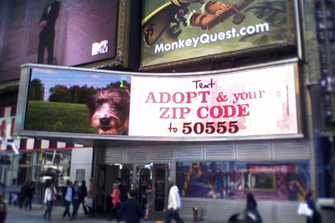 The video, which began running May 1 and will continue playing through June 30, encourages passersby to text "adopt" and their zip code to 50555 to get a list of links to adoptable dogs in the city or town where they live. Claudia Perrone, Best Friends' marketing manager, remarks, "The fact is millions of locals and out-of-towners are passing through Times Square every day. Since we bring our mobile phones with us wherever we go, and most of us are using them to find local information and then take action, it was a natural fit to engage with viewers on their mobile devices." Claudia says, "It's all about going local - letting people know that their new best friend is waiting in their local shelter to be adopted. We wanted to make it easy, so all they need to do is text us their zip code and we'll send them a list of adoptable dogs in their area." Mark your calendars: On Saturday, May 14, and Saturday, June 11, Best Friends' New York Programs volunteers, who will be decked out in blue "Looking for a new best friend?" T-shirts, will be on location to support the adoption campaign spot. These cheerful guys and gals will be hobnobbing with folks strolling through Times Square to spread the word about the importance of adopting from a shelter or rescue. Circulating the message about the benefits of animal adoption in the highest-traffic area of NYC and spreading doggie love through mobile technology are the primary goals of this Best Friends' campaign to bring about a day of No More Homeless Pets. Indeed, how could you resist love from a happy-go-lucky tail-wagger who just wants to lick your kisser?